Hongkong Electric will replace older generating units at Lamma Power Station with a new gas-fired combined cycle turbine unit in 2020 to reduce emissions. The more efficient L10 unit will help HK Electric meet the stringent emission requirements set by the government to increase the proportion of natural gas generation to 50 percent by 2020. It has signed an agreement with Mitsubishi Corporation to commission the construction of L10, which is expected to cost HK$3 billion. Managing director Wan Chi-tin, who signed the agreement with Mitsubishi in Tokyo, said the L10 will enable a cleaner power supply while maintaining reliability. “When L10 is commissioned in 2020, it will enable HK Electric to further reduce our carbon footprint and other emissions while maintaining power supply reliability,” he said yesterday. L10 is cleaner and more efficient after adopting combined cycle generation technology. It also has greater fuel efficiency through generating additional power from its steam turbine, which uses the high- temperature exhaust gas from the gas turbine. Gas generation produces fewer emissions than other fossil fuels, reducing its environmental impact. Meanwhile, Secretary for Environment Wong Kam-sing said the government is working to reduce the maximum return ratio of the territory’s two electric companies. Under the Scheme of Control Agreement with the government, each of the power companies is allowed to make a capped rate of return of 9.99 percent after tax on its average net fixed assets. It will expire in 2018. On a radio program yesterday, Wong said the government wants to increase the use of renewable energy. He said a public consultation last year found citizens they want to reduce the return rate to between six and eight percent. “We should not aim at the lowest ratio possible, but a balanced one,” Wong said. Australia’s Trisun Green Energy Co. has sought the Ho Chi Minh City government’s permission to conduct a feasibility study for a US$520 million waste-to-power plant. The plant will use plasma gasification technology to burn waste at 3,000 degrees Celsius to turn it into electricity. It is expected to cover a 13-hectare area in the outlying district of Cu Chi, the city government’s website said on Wednesday. Trisun Green Energy Co. said the plant could treat 2,000 metric tons of household waste, 1,000 metric tons of hazardous waste, and 2,000 metric tons of sludge every day, according to the website. Ho Chi Minh City now discharges around 7,000-8,000 metric tons of waste every day and this is expected to increase by 8 percent every year. Some 75 percent of the waste is buried, which causes wastage of land and pollutes the land as well as water sources. The rest is recycled or burnt. At the national level, 85 percent of 23,000 tons of waste is buried every day. The No 11 Citybus went into operation on December 27, covering a circular route from Central Ferry Piers to Jardine’s Lookout. Five electric buses have been taken out of service with glitches after less than two weeks on the road. Checks on three Citybus vehicles and two from New World First Bus revealed problems with the exit doors, so they were called back to the depot for maintenance. “The doors opened when the rubber trims of the door were pushed while the buses were still,” said a spokesman for New World Services, which owns the two franchised bus companies. The manufacturer, Shenzhen-based BYD, blamed minor problems with the software. “We have updated the software and retuned the buses to NWFB and Citybus for a thorough inspection,” a spokeswoman said. She stressed it was the first time anywhere in the world that the problem had surfaced and that the company would keep in close touch with the bus companies to ensure passenger safety. The city’s first electric bus – a battery-powered, single-decker with 31 seats – hit the roads on December 27. The Citybus vehicle went into operation on the circular No 11 route from Central Ferry Piers to Jardine’s Lookout. Two more Citybus circular routes, No 12 and 25A, started running over the next two days, while two New World First Bus routes, No 81 and 78, launched on December 28 and January 5. The Transport Department said the buses had passed safety tests and it would keep an eye on the issue. Breakdowns of electric buses made on the mainland have raised safety concerns. The Hong Kong Productivity Council rolled out its first locally designed, made-in-China electric bus for road tests in October, but it caught fire a month later. 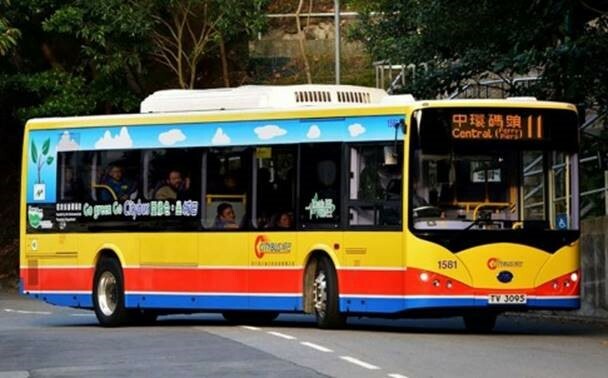 In 2013, Kowloon Motor Bus put a BYD green bus on trial for half a year, but if failed and was returned to the manufacturer. Fifty years ago, when China first revealed its nuclear power ambitions, most in the West dismissed them as Maoist propaganda, but there is nothing imaginary about the nation’s current boom in nuclear energy – and not everyone is happy about it. Scientists and conservationists fear the ever-increasing commercial and environmental pressure to expand the nuclear power sector means not enough attention is being paid to safety. Within a couple of decades, Hong Kong could be in close proximity to as many as 39 reactors, spread across Guangdong province. Two of them are nearing completion just 140km west of Hong Kong, in Taishan, in what has been labelled by green groups as the “most dangerous nuclear power plant in the world”. “China is developing its nuclear capability too fast; they just don’t have enough trained staff or adequate independent safety infrastructure,” says civil engineer Albert Lai Kwong-tak, convenor of Hong Kong think tank the Professional Commons and a long-standing opponent of nuclear energy. Yet, despite the reservations of campaigners, China is not only the world’s biggest market for nuclear technology but, according to the World Nuclear Association (WNA), it is set to “go global”. “The only country that is building plants to a significant degree is China,” says nuclear industry analyst Mycle Schneider, from his Beijing hotel room. And the driving force behind the nuclear push is no mystery. The nation is trying to meet an increasing demand for electricity while curbing its emissions of carbon dioxide. According to the United States-based Nuclear Energy Institute (NEI), from 1992 to 2012, electricity consumption grew from 666 billion kilowatt-hours to 4,468 billion kilowatt-hours – an average annual growth rate of about 10 per cent – and, currently, non-fossil fuels account for only about 12 per cent of supply in China. The climate change agreement reached in Paris last month seems only to have increased the political pressure to expand nuclear energy production. China’s senior climate negotiator, Xie Zhenhua, told a news conference in Beijing last month that nuclear energy was “essential” to meet the nation’s 2030 climate change commitments. 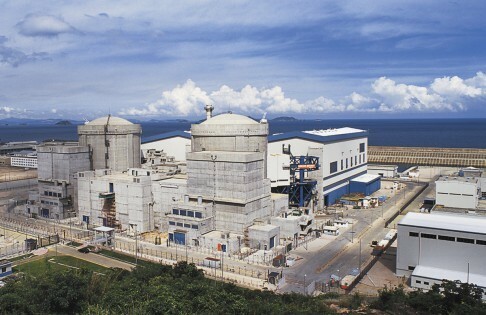 Lai is worried that, despite the track record at the Daya Bay nuclear plant, which has been supplying electricity to Hong Kong since 1994 and provides almost 25 per cent of the city’s needs, nuclear power is “not a mature technology”. He says there are still no proven safe means of disposing of radioactive waste and, despite pledges to build a dedicated facility, all of Daya Bay’s spent fuel rods are still in a temporary facility about 5km from the main plant. “In Daya Bay, we adopted French technology, but we now have multiple technologies and much of it is unproven,” says Lai, echoing the official findings reported to China’s State Council in 2012 as part of a nuclear safety review in the wake of Japan’s Fukushima disaster: “China has multiple types of nuclear reactors, multiple technologies and multiple standards of safety”. The reactors being built in Taishan appear to be among the most problematic. Construction of the plant was begun by French nuclear energy giant Areva and the €8 billion (HK$67 billion) contract with China General Nuclear Power Group (CGN) to install two third-generation European pressure reactors (EPR) there was heralded by Areva as “the largest international commercial contract signed in civil nuclear history”. The unveiling of the deal, at a ceremony in November 2007, was attended by the Chinese and French presidents in Beijing’s Great Hall of the People. In order to save time and money, according to Areva’s official website, the plant was to use technology that had been proven at two EPR plants already under construction in Europe. “Thanks to the operating experience gained by Areva’s teams on the two first-of-a-kind EPR reactors at Olkiluoto [in Finland] and Flamanville [in France], the project schedule has been shortened by 40 months,” reads a statement on Areva’s website. It is astonishing that this statement has remained on the website because there is no operating experience to speak of; both Olkiluoto and Flamanville have yet to go online. Both are many years behind schedule and billions of euros over budget. Olkiluoto is already the subject of a complicated and expensive legal dispute between Areva and its partners in Finland. Rather than being the third plant successfully using the technology, Taishan, surrounded by dense Pearl River Delta conurbations, is more likely to be operating untested EPR reactors, the first fully functioning ones on the planet, should they go into service. Both units are two years behind schedule and last April the news got a whole lot worse, when Pierre-Franck Chevet, head of French nuclear safety agency Autorité de Sûreté Nucléaire (ASN), reported that a “serious anomaly affecting a crucial component of the nuclear power plant” had been detected. Chevet hastily flew to Beijing but the outcome of his meeting has yet to be made public. He had added that unless he was satisfied with the plans to rectify the problem, he could put a stop to the EPR project in France, a decision that could have disastrous and far-reaching ramifications for Beijing’s nuclear ambitions and the French economy, which is heavily reliant on the nuclear programme in China. “The situation in France is absolutely critical because the financial status of the key nuclear companies could actually threaten the state,” says Schneider. Areva is in such a fragile financial condition, French state-owned power company EDF announced last summer that it was to take over at least 51 per cent of Areva’s reactor business. “The share price of Areva is just going from historical low to historical low,” says Schneider, who doesn’t think there is any quick fix to the EPR problem. China is committed to third-generation reactors on the grounds that they are safer and cheaper to operate than older technology. If it is proved that one of the two key designs – the EPR – is unworkable or unsafe, the nation’s entire nuclear programme is likely to be reviewed. In response to inquiries regarding the safety of Taishan 1&2 and Chevet’s dash to Beijing, ASN informed Post Magazine, “P.F. Chevet was in China last July. The visit was dedicated to the bilateral exchanges about safety”, without providing any further information. TAISHAN IS VEILED IN SECRECY, even though the safety implications directly affect tens of millions of people and the fear is that the very high levels of political and financial capital invested in the Chinese nuclear dream will eventually outweigh any public safety concerns. The principal evacuation zone established after the Fukushima plant was damaged by the Tohoku earthquake in 2011 was 30km. 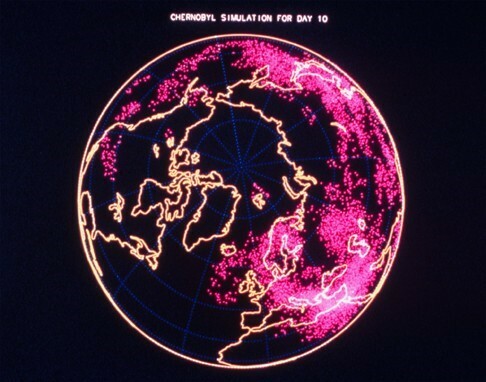 Nevertheless, says Schneider, technical evaluations have found hot spots of radioactivity 60km from the plant that were higher than those found in the exclusion zones surrounding Chernobyl, the Soviet nuclear power plant that melted down in 1986. The finances of China’s nuclear energy programme are eye-watering and the stakes are high. The total assets of CGN, which operates most of the Guangdong plants, are expected to have grown to one trillion yuan (HK$1.19 trillion) by 2020, according to state media reports, and the numbers affect economies outside China. According to the NEI, the direct economic benefit to the US of the recently renewed 123 Agreement to continue trading nuclear technology with China is expected to be between US$70 billion and US$204 billion through to 2040, when the agreement expires. Between 20,000 and 45,000 US jobs depend on that trade and those jobs are potential political gold in an election year – and the only customer for the American Westinghouse AP1000 reactor is China, which is currently constructing four, in Zhejiang and Shandong provinces. The third-generation AP1000 is also untested in the real world, and the reactors being built in China are years behind schedule, too. When, in November, Areva announced a possible minority stake sale to another major player, China National Nuclear Corp, and a partnership covering all aspects of the nuclear fuel cycle, some commentators saw it as a bailout by the Chinese. Schneider finds it astounding that anyone would seek a partnership with what he calls a “bankrupt company”. “Everybody is scared to death about losing billions of euros if these plants don’t open,” says Schneider, adding that all eyes will be on tests in France scheduled for this year and the ASN will be under enormous pressure. IN 2011, 172,000 PEOPLE were evacuated from the exclusion zone around Fukushima. Later that year, Nature magazine and Columbia University, in New York, reported that two-thirds of the world’s power plants have 30km radiuses that each encompasses more than 172,000 people. 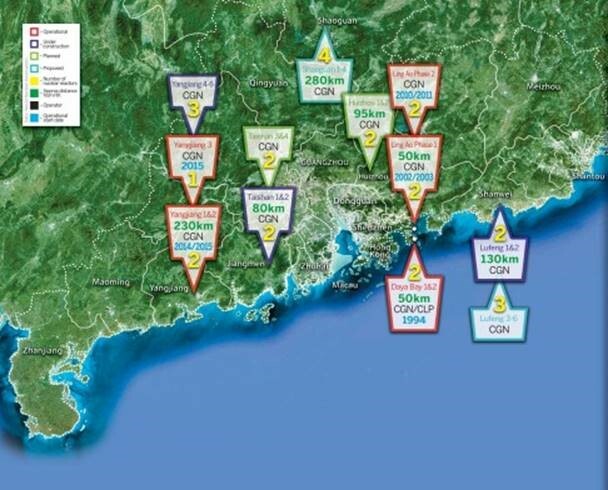 If that radius is widened to 75km, the plants at Longgang, in Shenzhen – Daya Bay and Ling Ao – top the league in terms of number of people most at risk, each threatening about 28 million people, including everyone in Hong Kong. The same Nature article looked at key risks for nuclear energy plants: the likelihood of external events (tsunami/earthquake/terrorist attack, etc), the age of reactors and what experts call “the culture of safety”. Age is a concern in China because nuclear plants are most dangerous at the beginning as well as at the end of their life cycles. The 1979 Three Mile Island accident in the US occurred in a reactor that had started operation only three months earlier, and the accident at Chernobyl occurred after only two years of operation. A serious loss of coolant occurred at the French Civaux-1 reactor in 1998, less than five months after start-up. With regard to external threats, one of the Guangdong plants on the drawing board is proposed for Huizhou, which, it is envisioned, will have two AP1000 reactors up and running by 2025. Earthquaketrack.com  reports that no less than 16 earthquakes have shaken Huizhou in the past 30 years, the most recent, on August 31, 2012, having a magnitude of 4.4. Nature explains that the “culture of safety” is an intangible value but extends beyond legislation and regulation to an innate appreciation of risk. Recent industrial accidents, such as the explosion at the port of Tianjin last August and the mudslide at a construction-waste site in Shenzhen last month, suggest such a culture isn’t particularly strong in China. 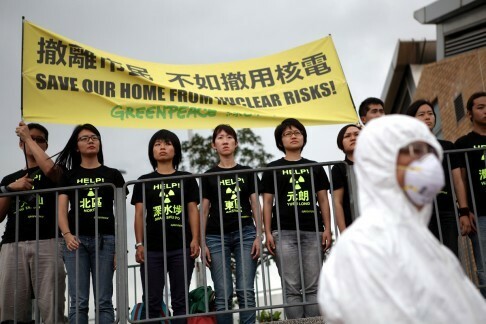 It comes as no surprise that Greenpeace Asia has consistently rejected nuclear power as part of Hong Kong’s energy mix – the parent group was initially set up to protest nuclear weapons testing, after all – but it has a separate concern about the proliferation of nuclear plants in Guangdong and how transparent the safety processes will be. In April, the environmental group wrote to the Hong Kong government requesting information about Taishan 1&2 and Yeeng was not impressed with the reply, which only reaffirmed that any major incidents would be reported as an extension of the protocol set up for Daya Bay and that “tests” were being carried out. “Transparency is very important about these plants because Hong Kong people have a right to know. The government is not proactive enough. We can’t just sit and wait to be informed when something does go wrong,” she says. Daya Bay is owned under a joint venture in which local power provider CLP has a 25 per cent stake, so it can exert pressure at board level and even offer public visits to the site. Its influence also extends to a limited extent to the four reactors subsequently built at the neighbouring Ling Ao plant, says CLP, in which it has no financial interest. “Besides being represented in the board of the joint-venture company of Daya Bay, CLP has also played an instrumental role in introducing international safety practices at the plant level,” says Tang Chi-cheung, senior director, nuclear at CLP Holdings. He says his company’s involvement has improved public communication and has played a part in “enhancing transparency”. He emphasises the environmental benefits of nuclear power, which, according to CLP figures, saves 7.5 million tonnes of carbon dioxide emissions from being emitted each year in Hong Kong. “To put the environmental benefit into perspective, it is equivalent to planting a woodland area of 57 times the size of Hong Kong Island,” says Tang, who does not rule out sourcing electricity from wholly Chinese-owned plants, including Taishan 1&2. “It is too early to get into the specifics of more nuclear imports given that it is a future decision to be reached by the government and the general community,” he says. Tang expresses confidence in China’s regulatory body and says that, post-Fukushima, the central government “has placed a priority on safety in its nuclear programme”. 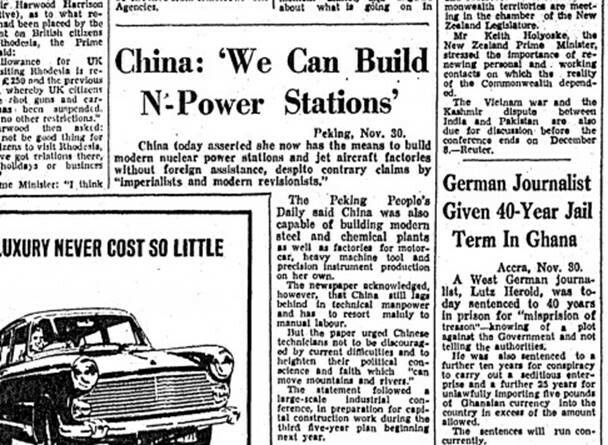 FIFTY YEARS AGO LAST MONTH, a front page headline in the South China Morning Post read, “China: ‘We can build N-power stations'”. And it has – but nuclear is still responsible for only about 2 per cent to the nation’s energy mix, and industry experts such as Schneider think China is possibly the last show in town for nuclear power, as the “smart money” moves to renewable alternatives. While no one is alleging negligence on the part of the Chinese Nuclear Safety Administration and many agree that safety has been tightened post-Fukushima, even advocates of nuclear energy express reservations in private about the frenetic pace of growth and the lack of transparency. Schneider says one senior Chinese academic confided in him at an energy conference in Macau that he thought the speed of expansion was “more than crazy”. One million signatures were obtained in objection to Daya Bay before it opened in 1994 and a 2013 Hong Kong government survey revealed that only 34.5 per cent of respondents were confident about the operational safety of Shenzhen’s nuclear power plants. Although a respected local operator such as CLP, with a share price to maintain, can influence decisions regarding safety at Daya Bay, such a mechanism does not apply to the other plants in Guangdong, including Taishan 1&2. “We need to get this right,” says Lai, because if the pace of expansion continues unchecked and the public and media remain excluded from the apparent nuclear success story until a Fukushima occurs in Guangdong, it may well spell doom for everyone in the Pearl River Delta.